(1 Corinthians 15:1-8) Moreover, brethren, I declare unto you the gospel which I preached unto you, which also ye have received, and wherein ye stand; By which also ye are saved, if ye keep in memory what I preached unto you, unless ye have believed in vain. For I delivered unto you first of all that which I also received, how that Christ died for our sins according to the scriptures; And that he was buried, and that he rose again the third day according to the scriptures: And that he was seen of Cephas, then of the twelve: After that, he was seen of above five hundred brethren at once; of whom the greater part remain unto this present, but some are fallen asleep. After that, he was seen of James; then of all the apostles. And last of all he was seen of me also, as of one born out of due time. (Luke 24:33-48) And they rose up the same hour, and returned to Jerusalem, and found the eleven gathered together, and them that were with them, Saying, The Lord is risen indeed, and hath appeared to Simon. And they told what things [were done] in the way, and how he was known of them in breaking of bread. And as they thus spake, Jesus himself stood in the midst of them, and saith unto them, Peace [be] unto you. But they were terrified and affrighted, and supposed that they had seen a spirit. And he said unto them, Why are ye troubled? and why do thoughts arise in your hearts? Behold my hands and my feet, that it is I myself: handle me, and see; for a spirit hath not flesh and bones, as ye see me have. And when he had thus spoken, he shewed them [his] hands and [his] feet. And while they yet believed not for joy, and wondered, he said unto them, Have ye here any meat? And they gave him a piece of a broiled fish, and of an honeycomb. And he took [it], and did eat before them. And he said unto them, These [are] the words which I spake unto you, while I was yet with you, that all things must be fulfilled, which were written in the law of Moses, and [in] the prophets, and [in] the psalms, concerning me. 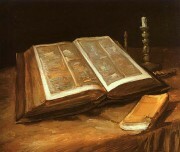 Then opened he their understanding, that they might understand the scriptures, And said unto them, Thus it is written, and thus it behoved Christ to suffer, and to rise from the dead the third day: And that repentance and remission of sins should be preached in his name among all nations, beginning at Jerusalem. And ye are witnesses of these things. (Acts 10:39-43) And we are witnesses of all things which he did both in the land of the Jews, and in Jerusalem; whom they slew and hanged on a tree: Him God raised up the third day, and shewed him openly; Not to all the people, but unto witnesses chosen before of God, [even] to us, who did eat and drink with him after he rose from the dead. And he commanded us to preach unto the people, and to testify that it is he which was ordained of God [to be] the Judge of quick and dead. To him give all the prophets witness, that through his name whosoever believeth in him shall receive remission of sins.